You can enter Latitude/Longitude in degrees with decimal point (e.g. 54.5°) or degrees, minutes and seconds (e.g. 54° 30min). Latitudes on the Southern Hemisphere and Longitudes westerly of the 0-Meridian must be entered as negative values. See Input Format for Latitude and Longitude for some input examples. 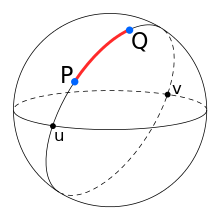 The distance between 2 points P1 and P2 is computed on a Globe width radius R and on Flat Earth with distance from north pole to equator EQ. If you want to use other planet sizes, enter your values into the corresponding fields, else leave them as is. You can reset the fields to their default values by clicking into the fields and pressing the ESC key. You can choose the units you want the distances to be calculated as km, sm or mile. sm is nautical miles as used in aviatic, mile is statute miles. The 3 fields for Latitude and Longitude accept all common input formats. You can enter the latitude or longitude using only the degrees field when entering any common format or enter it in degrees, minutes and seconds in the corresponding fields. You can set N,S,E or W before or after the number in the dregrees field or use negative numers for S and W.
Enter the value into the Degree-Field and leave the Minute and Second field 0. Enter the whole degrees into the Degree-Field and the minutes into the Minute field and leave the Second field 0. Enter each part into the corresponding field. If you have a negative Latitude or Longitude with the zero degrees then enter 0 for degrees and a negative minute: 0° −7 min 39.929 sec. If Degree and Minute are zero, enter the negative sign into the Second field: 0° 0 min −12.34 sec. Use the button →DMS to convert from Degree-Format to Degree-Minute-Second-Format. Use the button →Deg to convert from Degree-Minute-Second-Format to Degree-Format. This is useful to copy the position to google earth as one value. Flat Earth and Globe Earth are two models for the earth that are very different in geometry. Lets assume we don't know yet the right shape. On both models exists a way to define the shortest distance between two points. A point is defined on both models by a degree of latitude and longitude. The point with the same latitude and longitude correspond on both models to the same location, e.g. a certain city. We can derive for both models a formula to compute the distances. So we can make a corresponding prediction for both models. In order to decide which model is the correct one, we can calculate the shortest distance between the same two points for both models and check which prediction matches reality. If we find two points that give very different predictions for the two models, it is easy to figure out the right model. On the globe earth the shortest distance is the so-called Great-circle distance , on the flat earth this is a straight line. The real distance has to be gained by experiment, that means measuring the real world, not by distance indications on maps, since from this distance the correct model should be deduced. We can get the real distance between two locations by measuring the flight time of a direct flight between two locations and multiplying it by the average flight speed. Time and speed of a commercial airplane over a sufficient great distance give a good estimate for the real distance. In order to obtain a clear result, we use distances which are as different as possible in both models for the same two locations. These are mainly distances in the southern hemisphere. See Umrechnen von Fluggeschwindigkeiten how speeds are converted. The Taxi and Hold times must be subtracted from the Flight-Times to get the time relevant for the distance traveled. During the Climb and Descent time the speed is increasing/decreasing. So I take the mean speed for this period. That is half of the cruise speed. The climb/descent time is for all flights the same and I found a value of 45% · 1.5 h = 0.645 h here which matches my experience with flight simulator times. The difference is about 1.5%. The real distance is some km shorter because the airports are not aligned with the flight track so the airplane diverges after start and before landing some km from the direct route. The result matches without any doubt the Globe Earth Model. The Flat Earth Model is wrong by a factor of 2.5! Google Maps gives a Distance from Perph to Sydney along a road of 3934 km. You can drive this route with your car and check the distance with your car's odometer. The distance is much shorter than what the Flat Earth model predicts. To check wether the latitude and longitudes are correct on this page, you can buy a cheap Sextant e.g. on Amazon and measure the coordinates yourself using Celestial navigation technique. The cable follows not the shortest line between this cities (3290 km) because it has to follow the shore line. So its length is 4850 km. The shortest line on the flat earth map is 8300 km between Sydney and Perth. So even the shortest connection on the flat earth is 1.7 times longer than the cable that follows the shore line. Note: To prove that the following formulas are used in the calculations, you can insepct the Source Code of this Page. On a Globe the shortest distance between 2 points is a great circle.
' =' 'Latitude in degrees Nord. Negativ values for South.
' =' 'Longitude in degrees East. Negativ values for West.
' =' ' = Latitude in radian. Negativ values for South.
' =' ' = Longitude in radian East. Negativ values for West. I first convert the points polar coordinates to cartesian coordinates. Then the points are 2 vectors in cartesian coordinates. 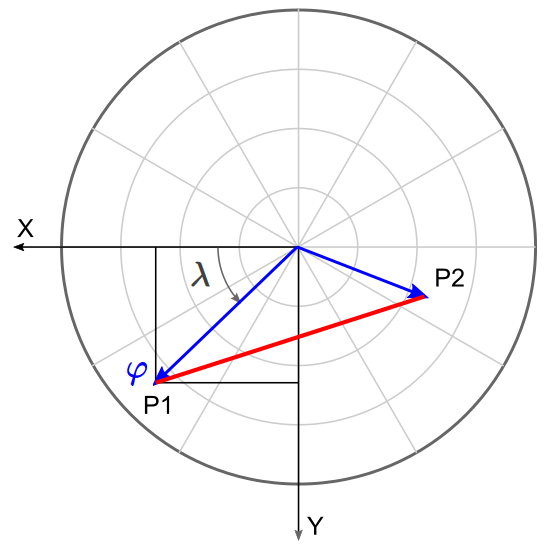 Subtracting one vector from the other and computing the lengt of the resulting vector gives the distance between the 2 points on a flat earth, which is a straight line. I just recently derived equations for flat and sphere and programmed them into Excel. I look forward to checking my results with your online calculator. This is great. Thank you. I got exactly the same answers with my spreadsheet as with your online calculator. I did it for San Jose CA to New York City NY, Perth Australia to Sydney Australia, and for San Francisco (SFO) to Dubai (DXB). Also I had already done a similar analysis as you did for Perth to Sydney, although I did not go into great detail on the flight time calculation like you did. I just cited what Google maps gave as a flight time. I had posted this on webpilot71 Youtube channel. Here it is. So I think a key is to calculate distances between points on both the spherical earth map and the flat earth map and compare them as well as against actual measured distances on the earth. So I took Perth Australia and Sydney Australia. For spherical earth map shortest distance (great circle distance on spherical surface) is about 2050 miles. For flat earth map shortest distance (straight line between two points) is about 5160 miles. Google maps shows driving distance of about 2440 miles. Now all we need it to get someone in Australia to drive from city to city and see what distance they get with their car's odometer. The google map also shows a flying time between the two cities of 5 h 5 min. This means that if the flat earth distance is correct the plane would need to fly around 1000 mph. For flat earth map I am assuming Azimuthal Equidistant map with distance from north pole to equator of about 6225 miles, the same distance from north pole to equator on the the spherical earth map (i.e. great circle distance). At least from what I am finding out so far, the cutting edge flat earth researchers are not yet willing to commit to a flat earth map, which makes it impossible to do comparisons between spherical and flat models, obviously. Could you provide some examples of how the fields should be filled out? Also I’m trying to find out if 3 suffeiciently spaced towers are placed on the same latitude will the middle tower be out of line when viewing the horizon outer towers lined up on a globe?Will your flat/globe simulator show this? Ray, see the new paragraph Input Format for Latitude and Longitude. The projection of the line of sight onto the globe surface is always a so called Great Circle Arc . That is the shortest connection of 2 points along the surface of a globe. The Latitude lines are not Great Circles except at the equator. Following a certain Latitude line from one point to another on the same Latitude is not the shortest path between these points. You can immediately see that for Latitudes very near a pole. You would move almost on a circle from one point to the other. So if you have 3 sufficiently spaced big enough towers placed on the same latitude and look from the first to the last tower, the middle tower would not lie between these towers, exept on the equator. Also, the Radius for both R and EQ don't change at all... any FE who see's this will instantly dismiss this for these reasons... I think its a shame for the hard work you have put into it all to fail on these trivial points, which FE's will latch onto and use as an examples of Globe retardness, as they would call it! fred, How can I make this easier? I have improved and simplified the description. Hope this helps. Globe = 3290.578721 km is the distance between Perth and Sydney in km on the globe, as indicated. Check this with google earth, it matches the real world. The value labeled Flat Earth is the corresponding distance computed for the flat earth, assuming a flat earth size where the distance from the north pole to the equator is the value in the field EQ. If you don't agree with this value, enter your value and the distances are computed using your values. R is, as described below the form, the radius of the globe used to compute the distance on the globe. Of course R and EQ do not change, because the size of the earth does not change. This fields are only for information. If you want to compute the distances using more accurate values for the radius of the earth or for the size of the flat earth, you can enter your values into this fields. That's all. I am aware that there are different formats in different countries for numbers. My website is international, so I choose the recommendet format by ISO, which recommend spaces for grouping big numbers. Dots are not recommendet because dots are used in some countries as decimal points and this can be confusing. When on land include the actual driving distance, possibly only for the Perth-Sydney button, that you can get from Google maps or otherwise. The reason being is is that it suggests that anyone can verify the distance simply by looking at their odometer which might persuade conspiracy minded people who think that surveying is suspect. For example, in the case of Perth-Sydney Google says the drive is 3934 km, which is a bit more than the globe Earth distance of 3290 km, which makes sense, but much less than the flat Earth distance of 8301 km, which is impossible. Replace "EQ" with "Pole to Equator". A bit longer, but it makes it clear. Include a brief explanation that anyone can independently verify longitude and latitude with a sextant, which has been used by navigators for hundreds of years, so it can't be that the longitude and latitude for cities is hugely incorrect. Also, it's possible to buy a plastic sextant on Amazon for $45, so it's not that sextants are exotic and inaccessible equipment. Make it clear that the code is open source. This both addresses the objection that you have some profit motive, and that the code is doing something sneaky. Parse "NSEW" suffixes and interpret as positive or negative. I think you could do this with a regex, or stepping through the string backwards without too much trouble. I could maybe take a shot at it. I have to agree with fred that the number format is confusing. I know that you're trying to make your site as international as possible, but I still think it's confusing to some readers. So for the example fred gave "3 290,578 721" I'd recommend "3290.578". Three decimal places should be plenty since that gets it down to a meter. No need to break up big numbers. A number in such form should be ready to enter into a spreadsheet, software or calculator. Thanks again for making a page that promotes science and reason. Steven, thank you for the suggestions, I have incorporated them all. I even decided to change the number format on all english pages to US format instead of ISO, because the ISO format seems not to become common soon in english regions. Wow, you did that quickly. And it looks great. I'll see if I can get you some more hits by referencing this page in comments on YouTube. Pick a long straight road, something you can drive down on cruise control with one of the metre wheel contraptions to verify and then input the start and end coordinates. For myself i chose highway 10 in saudi arabia since the full road is 162 miles and the vast majority is straight (although i chose a point several miles in to start due to a couple of bends). The calculated globe distance is 141.804772 miles. Flat earth calculated distance is 178.615313 miles. The distance had to be less than 162 miles since i wasnt doing the complete highway due to the bend and what do you know the globe distance is less. Just doing small straight roads in should come out with durther mistakes in flat earth model especially south of the equator. I have done both using the Law of Cosines, and assuming the Earth Radius as the one from North Pole to the Equator Line, giving 111.32 km for each Degree of Latitude wherever I needed to locate a certain place of interest. As I know, the official coords are fully wrong along official distances as they both fail the summation of angles within Triangles equaling 180º when calculating 3 different places at once. It´s quite visible whenever there is Sea in the way. A new Flat Earth map model needs to be developed sidelining the Gleeson's and Hammond's maps with their distorted masses of land for the Southern Hemisphere. All in all, leaving the Maths apart with all those confusing Greek letters, good job. What accounts for the difference in distance of a line from 0.0 Longitude along the Equator to 180.0 longitude? Ray, distances on the Gleason Map that go over the north pole are always correct. That is the purpose of this map in the first place. Because the shortest distance between 0 , 0 and 0 , 180 goes over the north pole on the FE map, 20,015 km is the same for Globe and FE. On the Globe the distance will always be the same 10,008 km no matter which path you take, because it will always be half around the Globe on a great circle. Sorry to join the party so late but I found formula to calculate shortest distance on Flat Earth between two points with known longitude and latitude without a need to convert them into Cartesian coordinates. where longitude and latitude are in degrees and follow same convention as described on this page. Note: it give identical result as equation on this page. This was done by calculating diagonal of equilateral trapeze created by bases of two equilateral triangles based on a two circle with common center (North Pole) each containing one point of given coordinates. Your calculation for the AE map is not correct. Just like the globe you can not just put a ruler on it and measure. The AE projection is exactly like the globe, north south is nautical miles, east west is hour arc-minutes. You have to use degrees to calculate any east west distance. They both use 360 degrees along the equator where each degree is 60 nautical miles. Remember the globe was not made to be used as a map and is not one. It was made an indexing system for navigation. The only place the globe is proportional to size is along the equator. Roland, you do confuse real shapes with maps. The real model/map of the earth is spherical. All flat maps of the globe are distorted projections, as we know. We only have flat map projections because globes are not so hany. We know that distances are only approximately correct on maps representing small portions of the globe. Navigation systems on the other hand don't use 2D maps/representations of the earth but spherical 3D systems and spherical trigonometry. Each location given with with latitude/longitude coordinates is internally a 3D point on a sphere. A map for a flat earth however is always flat without distortions and navigation systems could use plane trigonometry. Each location is a 2D point on a plane. Flat Earther claim the earth is really a flat disc, not only a projection/map of the globe to a flat disk. The globe model is not a projection of the earth, it is the right 3D representation of the earth, because the earth is a globe. Roland: Just like the globe you can not just put a ruler on it and measure. Wrong. You can measure distances on the globe model using a string and a ruler and they correspond to scaled real distances on earth. Take the string and span it between two locations A and B (both given with latitude/longitude) along the surface of the globe so it follows a great circle and then measure the length of the string with a ruler. After scaling up the measured length corresponds to the real distance on the globe earth, anywhere. We have to apply the same rules on the flat earth: Take the string and span it between the two locations A and B (given with the same latitude/longitude) on the flat earth and then measure the length of the string with a ruler. After scaling up the measured length would corresponds to the real distance on the flat earth, anywhere. This is exactly what I have implemented in my App. Only the model that gives the right distances, veryfied on reality, is the right model. And that is the globe model. Roland: Remember the globe was not made to be used as a map and is not one. It was made an indexing system for navigation. The globe model was not made as a map or indexing system. The globe model is a geometrically accurate representation of the spherical earth as it is measured by geodetic survey. So the natural way to express positions is to use spherical coordinates, latitude and longitude and use spherical trigonometry to compute tracks and distances between points. The AE map is a plane projection of the globe. Flat earth is not a projection, but is claimed to be a real physical thing. Flat earther state unmistakable the earth is flat, not is a projection of the globe. That's a huge difference. Real distances are measured on the real thing or on a scaled model with the same shape as the real thing. You have to use the corresponding model of the real thing to measure or compute tracks and distances. You must not use the globe model and spherical trigonometry to compute distances for a real flat earth. You must use the flat earth model and plane trigonometry to compute distances for the flat earth. Likewise you must not use a flat earth model and plane trigonometry to compute distances for the globe earth. Think about: Although flat earth uses latitude and longitude as a coordinate system like the globe, that does not imply that they represent the same geometrical points. One system represents points on a 3D sphere the other points on a 2D plane - big difference! Other difference: On a flat earth each line with constant latitude is a circle around the north pole. This includes latitude -90° latitude, which is the border of the flat earth. On a globe the line with latitude 0° (equator) is the straightest possible path around the globe along a great circle. Lines of latitude greater than 0° curve around the north pole on the surface of the sphere. Lines of latitude less than 0° curve around the south pole. Latitude -90° is a single point, the south pole. Do you claim, that the border of the flat earth with latitude -90° is a single point as the globe coordinate system tells? Would you be so kind as to calculate the distance between Santiago Chile and Wellington New Zealand on both the Flat Earth and the Ball Earth. In addition, would be possible to calculate the distance into Nautical miles? I would be extremely thankful for your effort. It is truly important. Many thanks!! It seems to be the absolute proof of spherical Earth, although it doesn't show if the Earth is convex or concave. One thing left: it is very problematic to check this proof practically, even if you are rich. Although I don't like conspiracy theories. And if to make the prooving task more complicated and to take off tight accordance of selestial coordinates and earth coordinates, and if to have only information about distances by time of flights between separate points, if goes about the most part of southern hemisphere. For fun. Else one crazy idea, but maybe not so crazy, how do you think? Nicolas: It seems to be the absolute proof of spherical Earth, although it doesn't show if the Earth is convex or concave. One thing left: it is very problematic to check this proof practically, even if you are rich. The geometry, that is the location and distances and their relationships work for both, the globe and a hollow earth. But the physics is not the same and tells without any doubt that we live on a rotating globe. Devices like navigation systems depend on this physical facts. Let me explain: On a rotating globe there must be a centrifugal acceleration perpendicular to the rotation axes away from the axes. The magnitude and direction wrt. the surface would depend on the latitude of the observer. It has to be added vectorial with the raw gravitational acceleration according Newtons laws to get the effective gravitational acceleration we feel and measure. If the globe or the hollow earth would not rotate, then there would not be such centrifugal accelerations. If the earth would be a rotating hollow earth, then the centrifugal accelerations would point towards the ground in an angle depending on the latitude of the observer. Can we measure such a change in the gravitational acceleration due to the rotation of the earth? The raw gravitational acceleration according to Newton depends on the latitude too, because the earth is not perfectly spherical but approximately an ellipsoid so that the distance from the mass center of the earth varies with latitude, but lets take the mean gravitational acceleration for comparison: 9.81 m/s2. This means that the centrifugal acceleration is about 0.34% of the raw gravitational acceleration. You should weigh 0.34% less on the equator than on the poles due to the centrifugal acceleration. Can this be measured? The answer is yes, even with a simple cheap precision scale! And what we measure is exactly what is predicted for the rotating globe earth. Precision scales have to be calibrated for each latitude with a known mass to compensate for the centrifugal acceleration at that latitude for this reason. The Eötvös effect observed in aircraft - how does it affect Gravity? Recap: Although the geometry would work the same way for a hollow earth and a globe earth, if we ignore the third dimension, pyhsics is different and thells us we live on a rotating globe. If we include the third dimension (up) in exact measurements of the earth, like geodetic surveyors do, we find clearly that the earth is a globe and can not be concave. Light does not bend in the atmosphere in such a way that the measurements could be all wrong. We know the physics of refraction very well and can measure it. We can measure the centrifugal acceleration with simple cheap experiments as Wolfie showed. To find out whether there could be other physical effects that produce similar effects, read the linked page. Each possible effect is calculated and compared in magnitude with the centrifugal acceleration. And the finding is, that the centrifugal acceleration is by an order of magnitude the strongest effect of all possible other forces beside gravity. As a sidenote, the ellipsoidal shape of the earth is such that the combination of the raw gravitational acceleration due to the mass of the earth and the centrifugal acceleration acts always perpendicular to the surface of the ellipsoid and not towards the center of the earth. Why is that the case? It's because the earth is not solid. If the effective gravitational acceleration would not be perpendicular to the surface, it would result in tangential force components that causes streams that shape the earth as long undtil there are no more tangential forces. This is the case, when the earth reaches a shape, which has the same equipotential at each point on the surface. This shape is an ellipsoid of rotation. It's the shape the water of the oceans forms. It's the shape of all rotating planets and suns. So mean sea level has the shape of approximately an ellispoid. There are minor deviations due to some local inhomogeneities in the mass distribution, eg. due to mountains or different rock types in the crust. This deviations are accounted for in the so called Geoid and the GPS heights, which are calculated from the reference ellsipsoid, are correceted accordingly to get the real altitude wrt. mean sea level at each location of the earth. Absolutely, if selestial sphere above us is real, and selestial bodies on it are the real physical bodies with definite places, that we see, with no doubt the Earth is a globe, of course. Then the meanings of atmospherical refraction are true, geographic coordinates are true, and many other things. If unreal, everything becomes very uncertain. Among different tryings to show spherical Earth terrains on a plain surface there is stereographic azimuthal projection. This is one of most ancient methods of mapping, and of mapping of whole known world, or Earth surface. Maybe most ancient one. The difference between usual azimuthal projection world map, that flatearthers believe the real world map, and stereographic azimuthal projection world map, that meridional distances are increased proportionally like distances along parallels. So this projection has no shape and angle distortions on short distances but only distortions of distances. So my fantastic hypothesis claims, that this is the real world map of Flat Earth, but with some especial feature: this proportion between distances on globe and our map acts not only towards distances, but to all physical objects and velocities. This way everything, that moves along meridians, changes it's size, even light wavelengths and sizes of atoms. The question is: Is there any difference between observed geometry of that world and spherical Earth? Wondering where you got that artificially inflated number for the FE distance between Sydney and Perth? Logically, the FE distance will be actually less than the distance driving it in a car on the map, since it would be a straight line, and the highway isn't exactly a straight line. Kathy, that is the crux of this whole page! On the flat earth all distances east west on the southern hemisphere, whether straight or along a road, are way too long compared with reality. Straight lines on the flat earth map are shorter than roads on the flat earth map, sure. But they both are way too long compared with reality. That's proof that the earth can't be flat. The distances of the flat earth do not match reality. But the distances calculated on a globe match reality exactly. So the earth must be and is a Globe. See Used Formulas for Flat Earth how a distance on the flat earth is calculated from latitide and longitude of 2 locations. The distances on an AE map (flat earth map) are only correct in the north-south direction. That was the whole purpose to create an AE map. It is a special kind of projection of the Globe. Great site, Walter. I only became aware of the FE a couple of months ago and was kind of intrigued by the idea, along the lines of, how could anyone think that. Your site addresses my biggest dilemma: distance in the real world vs globe model vs flat earth model. In the real world it takes about the same time to drive or fly across both the United States and Australia. From that I conclude they must be about the same width. On a globe model they measure about the same distance across, but on the flat earth model Australia is almost twice the width of United States. I could shrink the width of Australia on a flat earth to make it fit real earth (I can't expand United States), but if I do that I still have the problem of the distance between Johannesburg and Perth. I can't shrink that without making the Atlantic Ocean ridiculously out of proportion. Therefore I have to conclude that the globe model more closely represents reality. I have not yet found a flat earth model that addresses this problem. There are many flat maps that represent the globe world in different projections and they have distance problems, but we accept that and use them for the information they contain. If the flat earth model is a map representation then I could accept it with it's limitations. However, if it is a representation of reality then it seems to have serious problems. So, thanks for the time and effort you put into this site. Helped me alot. (1) You cannot have a pressurized atmosphere without a container. (2) Water can never conform to the exterior of an object. (3) A body of water will always find its own level. (4) Even considering refraction & atmospheric obstruction, we can see buildings & mountains too far away. But you can have a pressure gradient in the atmosphere due to gravity without a container, and that can be measured with a barometer. But there is no boundary where the pressure suddenly changes like with a container. The pressure decreses more and more with distance from earth's center of mass until there are only a few atoms left per m3 and you can no longer use a barometer to measure the pressure. But there is everywhere some gas in space. Never heard about solar wind? How can there be a wind without gas? Do you not know how stars and planets are formed ? From gas clouds attracted and condensed by gravity until they form a ball of gas whith enough pressure and temperature to start fusion. You can see gas clouds in space with a telescopt all over the place. For example here . And even the moon is technically still inside the very diluded gas that belongs to the atmosphere of the earth. Globetardos Extremos: Water can never conform to the exterior of an object. A body of water will always find its own level. The surface of water is dictated by all acceleration potentials, e.g. the sum of gravitational potential and centifugal acceleration potential of an object like the earth. The water surface must lie on a layer with constant acceleration potential everywehere. If there where any difference in the potential at some place on the surface of water, this would result in a local difference in acceleration between neighboring molecules of water that would distributes the water to neighboring reagions until all water is on the same level again. This level is not flat on a planet. So water would only be flat in a hypothetical gravitational field without any centrifugal accelerations, that builds flat parallel equipotential layers. Such fields do not exis naturally in the universe. All graviational fields are spherical or sums of overlapping spherical fields and other accelerations. Only locally on a very big sphere the field is approximately flat. This is the reason why water in a container is almost perfectly flat to the atomic level. But big lakes and oceans are not flat. The curvature of a big lake like the lake Ponchartrain is measured with precision survey GPS devices in more than 6500 data points. The points, which are raw 3D coordinates (not assuming a globe) lie on an arc for each lane. From this points the calculated radius of the arcs matches exactly the official radius of the earth at this locations. If we overlay all data points with Soundly's image, both show exact the same curvature. So Soundly's images are not due to atmospheric effects, because GPS is not influenced by the atmosphere. Equipotential levels on earth have the shape of a Geoid due to small variation in the gravity field, which is approximately an Ellipsoid . So sea level has exactly the shape of the Geoid. Geodetic survey has measured the gravity field to such a precision, using Gravimeters and satellites, that we can measure the Geoid to sub cm accuracy. GPS navigation devices must know the exact shape of the Geoid to correctly calculate the elevation of the observer above mean sea level everywhere on earth. Elevation is defined as the vertical distance from the Geoid surface. Globetardos Extremos: Even considering refraction & atmospheric obstruction, we can see buildings & mountains too far away. What do you mean by atmospheric obstrucion? Fog? I never ever saw any image which does not exactly show what the globe model with refraction predicts, not even from Flat Earthers. Flat Earther commonly use the wrong equations for hidden height: 8 incher per mile squared. This equation calculates the drop from the tangent at the observer with distance. Or they do not take the accurate observer height into account (which is very sensitive to how much is hidden) and ignore Refraction. See here for the the Exact Equations for the Hidden Height ( Advanced Earth Curvature Calculator). Flat Earther like to look directly through layers of atmosphere directly above water, where refraction is considerably higher than standard refraction some meters above the surface everywhere. See all the laser test over water at night. In these conditions the earth seems to be flat, because the laser can be seen over any distance. On day light you would recognize the strong distortion directly over water. No surveyor does measure under those conditions, knowing about how refraction works. The globe model predicts that directly over cold water or ice refraction is so strong (k > 1) that the light gets bent along the surface, making a laser visible at any distance at the ground. All this laser tests from flat earther are worthless to measure the shape of the earth. They only prove that refraction is strong over the surface of water. See Simulation of Atmospheric Refraction with strong refraction over water compared with flat earth with no refraction. One flight that is impossible on flat earth is Qantas flight QF27. These are direct non-stop flights between Sydney, Australia and Santiago, Chile. Simply the airliner (a Boeing 747-400) would run out of fuel on the flat earth. And would have to fly faster than twice the speed of sound to make the schedule on time. QF28 is the return journey, so its not wind assistance. And these flights occur 3 or 4 tines a week, every week, regardless of the wind speed and direction. It amuses me that Flat Earthers can not agree between themselves what FE model is correct and they're unable to provide a model with no flaws or controversy. While everyone is in agreement with the spherical globe model and all the physics, maths and navigation works. I put Lat and Long from the airport of Sidney to the airport of Santiago of Chile, picked up from Google Earth. The result of calculated distance is about 7,224 Km, for Lo 151° and 70°. /// The result of calculated distance is about 11,341 Km, for Lo 151° and -70°. The only accepted characters are E for east and W for west, N for north and S for south. There is no recognition of characters used in other languages than english. So the O is simply ignored, which is in your case wrong. So 70° O should be entered as 70° E or -70°. Which leads to a globe distance of 11,347 km = 7050.9 mile. Of course the distances depend on the coordinates you enter. The cities are some km in diameter. Another thing is, that this App calculates the distances for a perfect sphere. But the earth is an ellipsoid. So software that uses the official WGS84 ellipsoid model, like google earth and GPS, get slightly different values. I think 11,347 km or 11,327 km is close enough to show the difference between globe and flat earth. The difference is less than 0.2%.